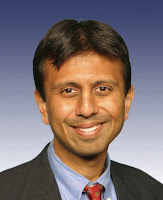 Haq's Musings: President Bobby Jindal? Republicans chose their rising star, Gov. Bobby Jindal of Louisiana, the first Indian-American governor of a US state, to respond to President Barack Obama's first address to the joint session of the United States Congress last Tuesday. The expectations were high, but the reviews of his performance have been swift and scathing: Amateurish. Disastrous. Clearly, the 36-year-old GOP governor was tasked with a big challenge: Be charming and persuasive in a seemingly critical response to the highly articulate and charismatic new President riding a wave of popularity. While the president had the benefit of the ornate halls of Congress as his speech setting and numerous camera angles to give a sweeping view of the grand House Gallery and repeated, vociferous applause providing the soundtrack, Jindal had to deliver his speech in a solitary room amid an almost total silence. But Mr. Jindal has been criticized on both style and substance. Fox News commentator Juan Williams focused on Jindal's delivery. "It came off as amateurish, and even the tempo in which he spoke was singsongy," Williams said, adding that the content of the speech was "very simplistic and almost childish." His criticism of government spending for emergency economic relief has been widely derided, given his state has been the biggest beneficiary of billions of dollars in federal aid after Hurricane Katrina in 2005. Jindal has not been spared even by his conservative Republican supporters. David Brooks, a conservative New York Times columnist who has criticized aspects of the stimulus plan, nonetheless called Jindal's arguments "insane" and tone-deaf given the dire economic challenges the country faces. "To come up in this moment in history with a stale, 'Government is the problem, you can't trust the federal government' is just a disaster for the Republican Party," Brooks said on PBS' "The NewsHour With Jim Lehrer." "It's not where the country is, it's not where the future of the country is." By all accounts, Jindal's debut on the national scene has been a disaster. Can he recover from it and still pursue his ambition to be the first US president of Indian-American descent? I think it's still possible. He is young and ambitious and he has the time on his side. If he learns from his recent experience and does dramatically better at a future Republican party convention, his recent disastrous performance will be forgotten. Jindal should continue to pursue his dream of becoming the first India-American to sit in the Oval office as the commander-in-chief of the world's most powerful nation. He is a christian convert. hindu extremist bjp supporters in u.s. won't be happy with that. Christian or not, for his first shot at governor, 40% of his campaign funding came from outside Louisiana. Major contributions came from New Jersey, Houston, Chicago and California. There are not that many Indian-American Christians to put up that kind of money. Not to obscure the fact that he completely bombed against Obama. He sounded just a wee bit better than Palin. He's probably blown his 2012 chance - unless he makes amends really quick. Bobby Jindal has not just suffered Democrats' slings and arrows. Even Ann Coulter, the right wing queen of the outrageous, has reported to have said, "Wasn't Bobby great in "Slumdog Millionaire"?" I guess this is not surprise after Hilary Clinton's "Gandhi at the gas station" and former Republican Sen George Allen's "Macaca" remarks about Indian Americans. What does poor Jindal have to do to be accepted?